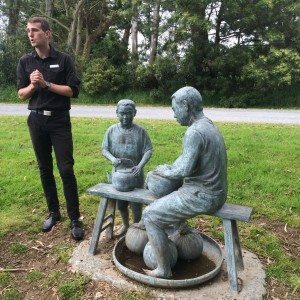 The Zealong tea plantation – just 10 minutes out of Hamilton and a 1.5 hour car drive South from Auckland – was THE place I was looking forward to the most on my journey to New Zealand. 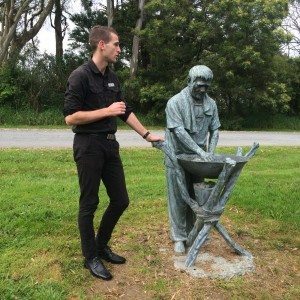 I was lucky enough to have 6.5 weeks available to venture through New Zealand – both North and South Island – and Zealong was the place I had to visit first. My visit to the plantation is now roughly 2 months ago. 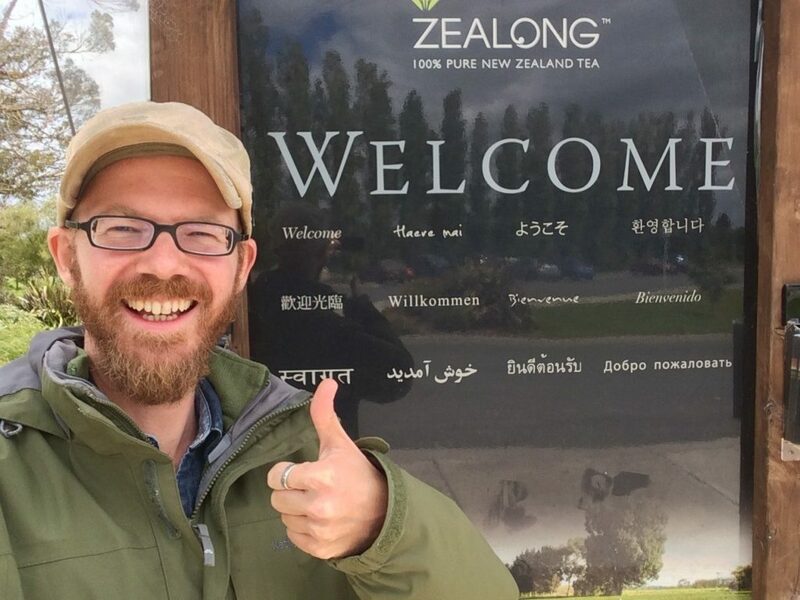 I was there in late October and early November 2014, which fell just into picking season. 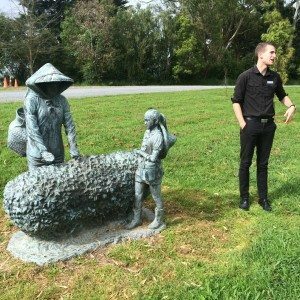 The first time I heard about this plantation was back in Sydney at one of my most favorite places there, the Dragonwell Tea House. 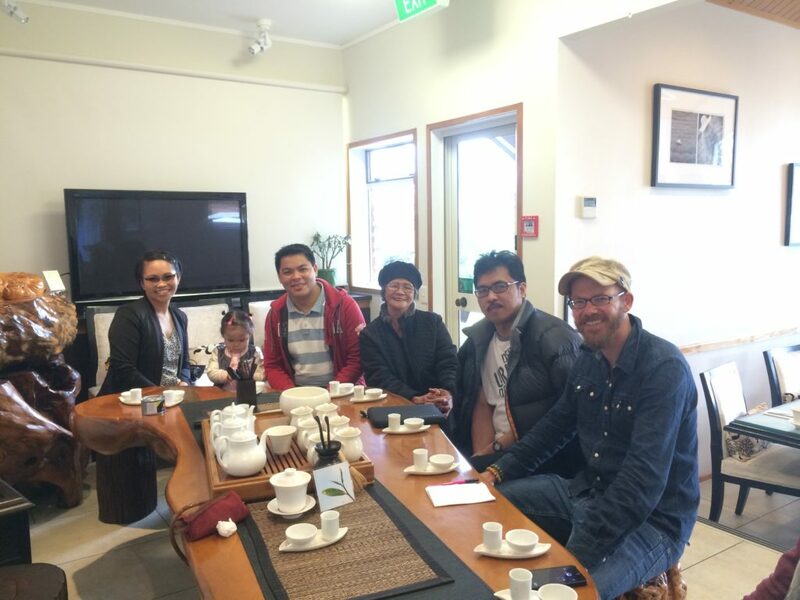 I was sitting together with some other tea lovers, when two of them mentioned that they were about to fly over to Auckland in order to meet with the guys from the Zealong plantation to talk business and a possible cooperation. I could hardly believe the news, that there would be a reputable plantation in New Zealand. And that was mostly because NZL has to face the same preconditions as Australia in that regard. Labor costs are quite high and pretty much make hand picking and quality processing of the tea almost impossible to pay for. This was for example just the case for the 2 plantations I visited in Australia – Nerada and Daintree – both were using big picking machines and CTC in the end to shred the poor tea leaves into pieces. As we all know in China and other countries when it comes to labor costs, it is a much different (and most often sad) story…. Ever since I heard about the plantation, the big wish of going there at some point never left me. I did some research back in Sydney about Zealong and found out, that the company is even more famous in the Asian world than in the Western. Zealong’s marketing goes in one specific direction and that is: Clean tea. Not for a specific reason they use the following slogan in all their campaigns: Zealong – The Worlds purest tea. And this statement is something which attracts in particular tea lovers from China, who appreciate tea which comes from a country that does not have to suffer from the big problem of pollution. The plantation has even had TV appearances in Chinese TV I heard. Zealong claims to not use any pesticides on their plants and to only use natural fertilizer. 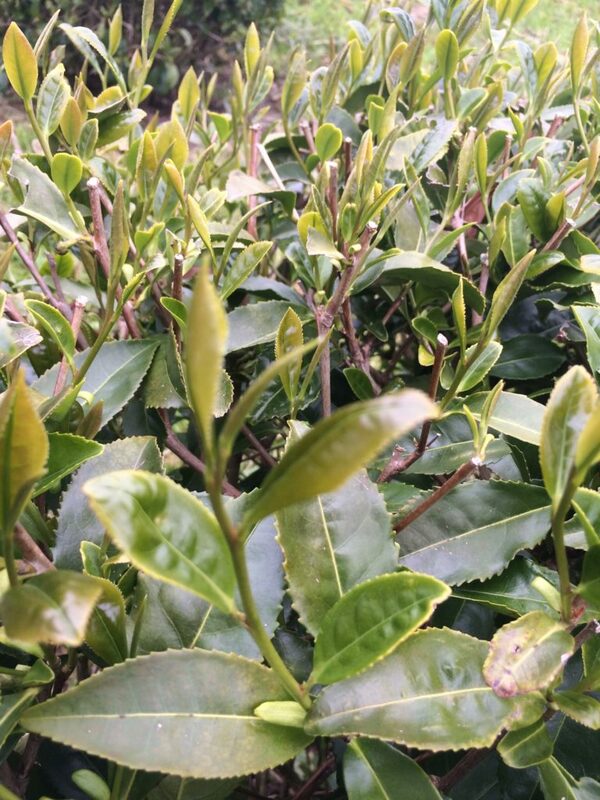 To that comes the very clean environment, the good air, water and soil of New Zealand and this leads to – there you go – the tea plants having an ideal place to grow and flourish. I wanted to try their tea directly at the plantation and see if their reputation can hold what it promises. I actually tried their minimal oxidised Oolong, which they call “Pure” back in Sydney and my first impression was that the tea tastes good – yes – and similar to Oolongs I know from Taiwan, but in the end it lacked a certain kind of edge, character, that distinguishes it from other Oolongs; something that makes it special. In the end I found my way to NZL, soon arrived at the plantation and booked a guided tour over the whole estate. In my group there were a couple of Malaysians from Auckland. Most of them were coffee drinkers, who heard of this place in the local news. 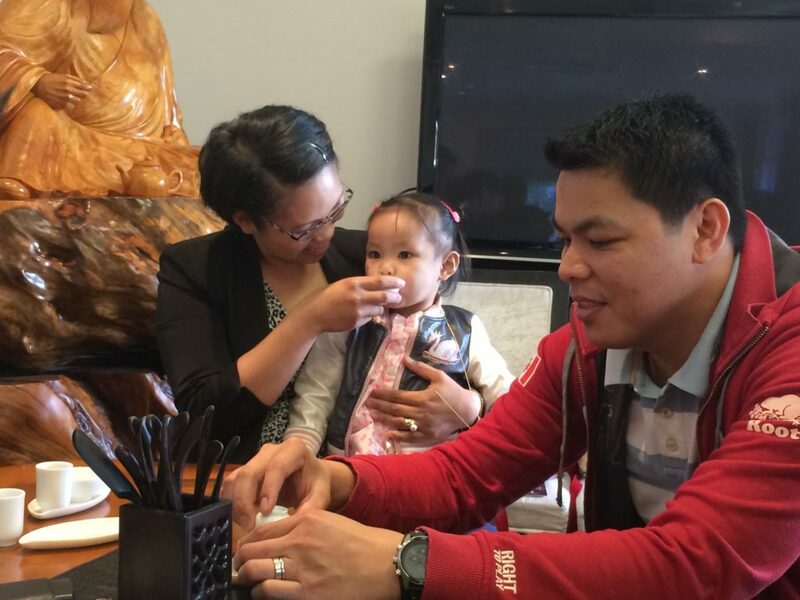 I was specifically interested in their opinion later on about the Zealong tea, when we would come to the tasting part. Statue showing tea rolling in Wok. A statue showing traditional tea compressing. The first statue showed the picking process, the second the actual roasting or firing of the leaves and the third one showed how the leaves get placed in a sack in order to be whacked around, the final stage. 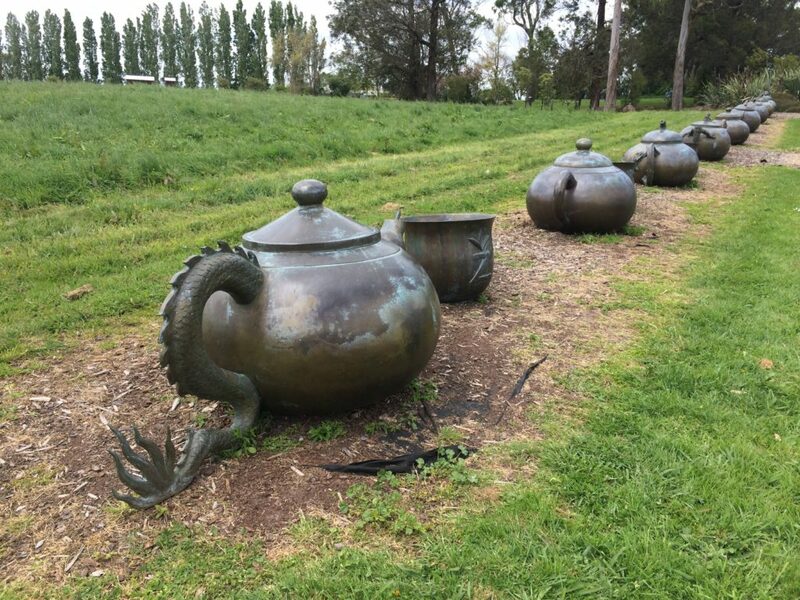 Besides these statutes there was an impressive line of huge metal Yixing pots to look at. And those were all imported from Taiwan I learned, very impressive. Our guide of the tour was a young lad from the Hamilton area. Fantastic to hear that his new job at the plantation actually made him interested into the world of tea. Before he worked there he had no affection to tea really, but then eventually experienced the beauty of it and is now a tea addict just like me. He picked us up from the parking spot and lead us along a couple of stone statues that showed the traditional way of making Oolong. We then got to see the actual plants and the plantation. The fields went into the far distance and I remember being impressed by the size of the whole complex. What really surprised me though was the fact, that the whole plantation was rather flat. No hills and no mountain slopes. Well, the whole area surrounding it was just like that and actually how I later learned, the whole North Island of New Zealand is rather flat, except for the Volcano region South of Taupo. I really wondered, because as all the reasons for why this place had been chosen for the plantation just seemed to have been selected so wisely and, to my original understanding, with the intention to provide the utmost and best environment for the plants to grow, this actually spoke against it. I learned in the past, that the best growing conditions (for high class teas) would be along mountain slopes because of the mist and the indirect sunlight that goes with it. Less sun means slower photosynthesis and therefore produces plants that take more nutrients from the soil which produces more intense tasting shoots. At least thats what I read in books many times. 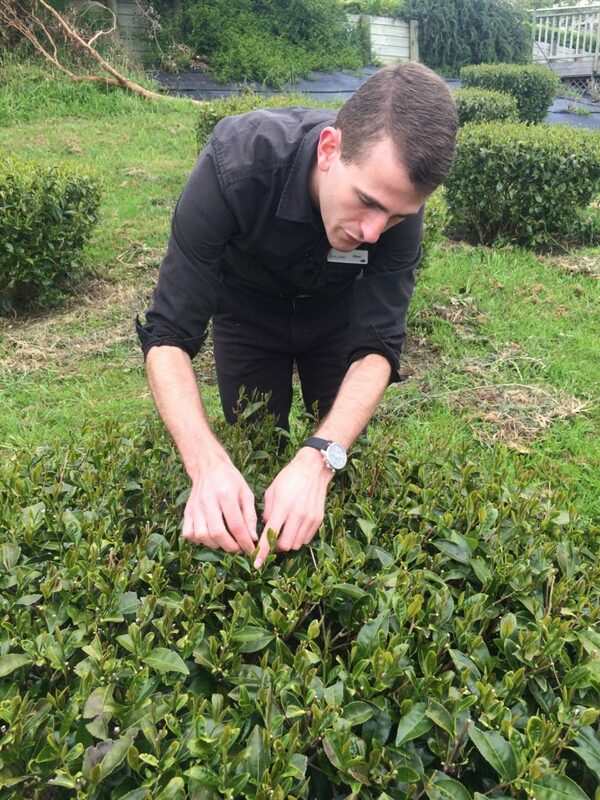 Picking leaves in Zealong tea plantation. “Flowering, lush and green, the camellia grew next door to Tzu Chen’s house in New Zealand’s Waikato region. A lover of tea, Mr Chen was struck by the similarities between tea plants and the camellia. 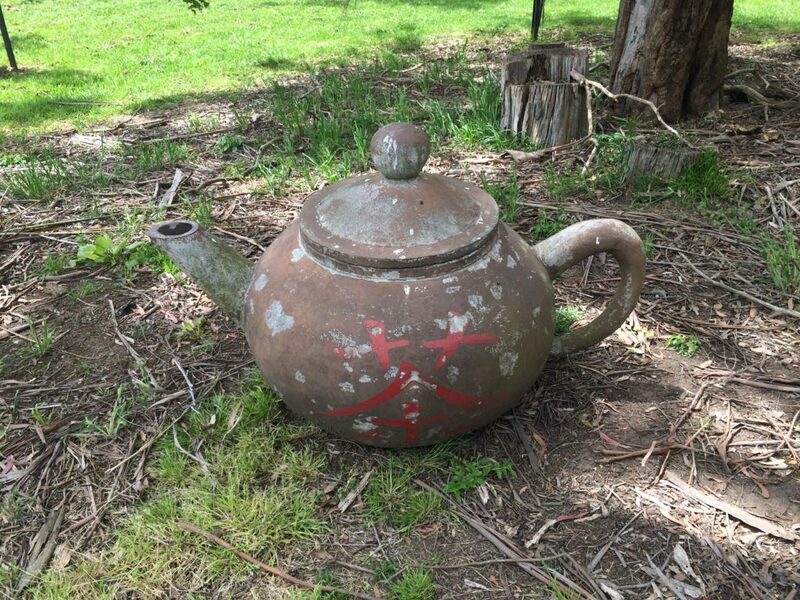 To Mr Chen, the thriving camellia plant meant New Zealand was not just pure and clean, it was also the perfect environment to grow one of the world’s best teas. In 1996, Mr Chen and his son Vincent imported 1500 tea seedlings from Taiwan. They were left with only 130 after a rigorous quarantine from New Zealand’s Ministry of Agriculture. But after careful propagation Zealong’s lush, sweet tea plants number in the thousands and spread over 40 hectares. A wealth of knowledge gained through the years, coupled with a hand-picked team, has meant Zealong isn’t just perfectly grown and chemical free, but also processed to the highest international food standards. From our guide I learned some additional info such as that Mr Zhen was working in real estate before he turned to tea. For me the idea why he wanted to do tea is obvious. He has a Taiwanese background and Taiwan produces the finest lightly oxidized Oolong tea in the world (in my opinion). To me its just logical to bring the tea which plays such an important role back in Taiwan to his home of New Zealand now. He obviously experimented a lot with different tea cultivars and in the end found one which was greatly harmonizing with the “kiwi” soil. That in this whole process the New Zealand government was looking closely and rigidly what Mr Zhenwas doing with his imported plants, I dont have to point out I think. Every visitor to New Zealand has to go through multiple quarantine checks at the airport before he/she is let through into the country. NZL is super protective of their natural environment and do not want to have any foreign organism imported to the country. Therefore I can just only assume how much of negotiation must had been involved before the first actual tea plants could be planted into the New Zealand soil. Now thats the story behind it and Mr Zhen chose the place out of convenience because he lives in Hamilton, which makes it easy for him to supervise the plantation. I am also sure he had good knowledge about this paricular area cost wise simply because of his real estate background. On the plantation we kept on strolling along and were then led into a little house that was overseeing the whole tea garden. We were shown a video that explained a little bit of the story behind Zealong. After that we all went into the restaurant where we would experience the tea tasting. Now this is something very special about the Zealong complex. It is not only a plantation that focusses on the production of tea, it also contains a high class restaurant with excellent food. The interior is quite classy and definitely borrows from an authentic British high tea venue. Its in the end a beautiful fusion between Asia/Taiwan and England/Britain. The food in the restaurant is of high quality too, just as the tea. 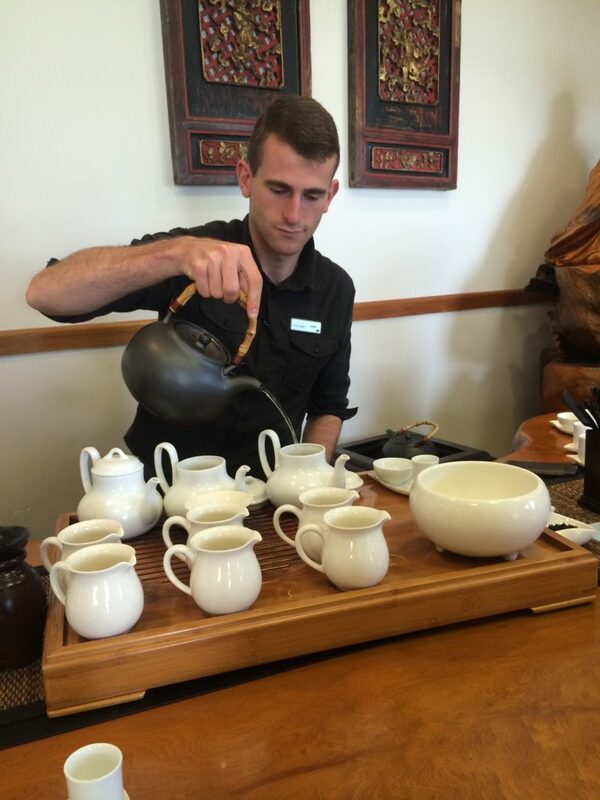 We then got to experience a traditional tea ceremony and would get to taste the “pure”, the “aromatic” and the “black” out of the Zealong tea variations. To my surprise the “pure” Oolong tasted much better than the first time I tried it. This time the very floral aroma of the Oolong came through, which I knew and loved from comparable teas like Ali Shan Taiwan tea. It did not taste that flat anymore and became better from infusion to infusion. The rest of the group did not enjoy that tea that much, which was of no surprise to me really. All of them loved the “black” tea of Zealong. Also our guide told me that most of the usual coffee drinkers would go with the black, simply because of the strong and distinct taste of it which they know from their coffee. Greens and lightly oxidized teas mostly are simply too delicate for the taste buds of the coffee tongue. I also quite enjoyed the “aromatic” one but not so much the black one. 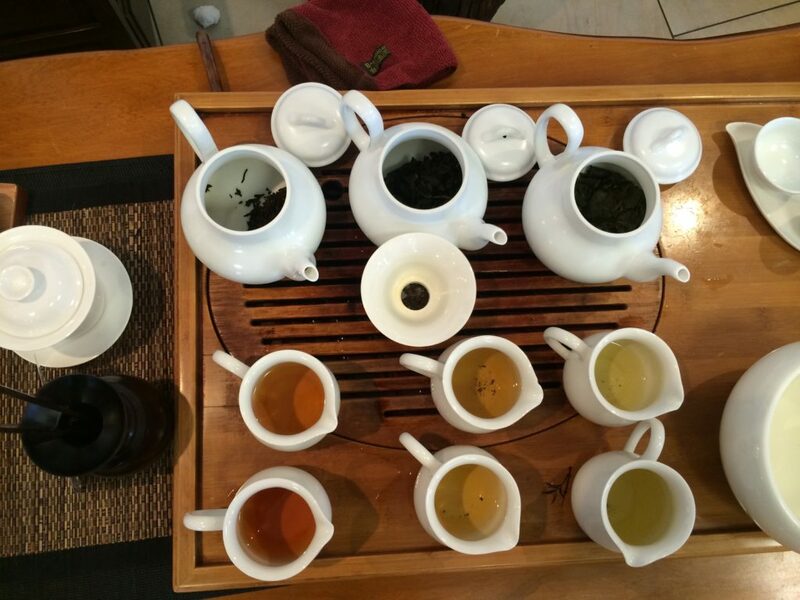 While their masterpiece is simply the “pure” one, the others feel like they had been added at a later stage to add more variety to the tea collection of Zealong. This goes not so much for “aromatic” and “dark”, but especially for the “black” one. All other teas were smelling absolutely beautiful, though, and showed that they originate from a fantastic natural environment and that they had all been hand picked. Group photo of all participants. Tea fan from an early age. At this point the plantation is still a big secret. You do not find it in any Lonely Planet Guides or other travel guides. You do not see it very much advertised in information centres either. For now its something just the local (and the Asian tea boheme) knows about. To me this is a magical place and worth for every tea lover to visit. 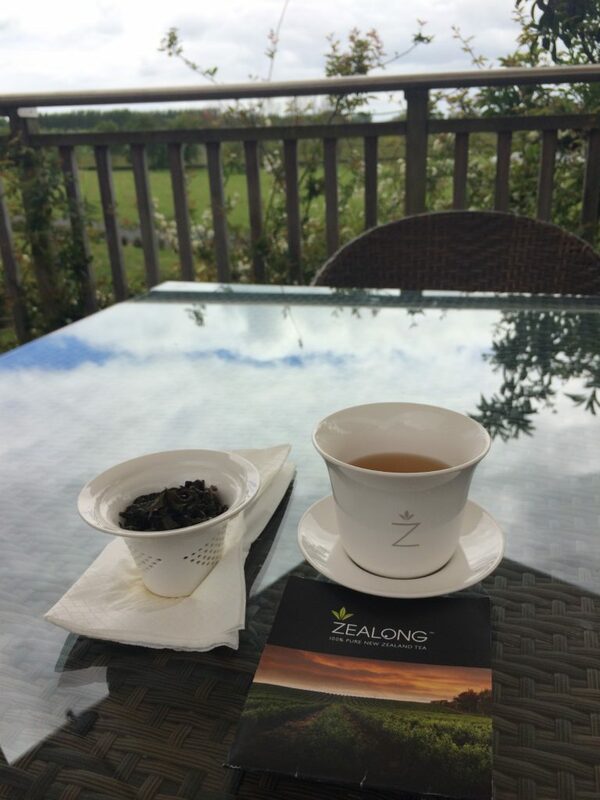 If you are ever in the Southern hemisphere below Asia, try to visit Zealong tea plantation.